Your fabulous UBC Arts Academic Advisors will be here for drop-in advising each week in your Gateway Study Suite. They’re ready and waiting to answer your questions, big and small. Majors? Minors? Honours? Study and Exam tips? Time Management? Your 2nd Year and Beyond?!? 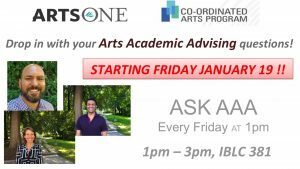 Every Friday, 1pm-3pm in the IBLC 381 meeting room (next to the study carrels).